Home» AP GO's | AP LATEST update » AP fee structure for M.E./M.Tech Courses as per G.O.NO:40. AP fee structure for M.E./M.Tech Courses as per G.O.NO:40. Andhra Pradesh AP Fixation of fee structure for M.E./M.Tech. courses in Private Un-Aided Professional Institutions as Per G,.O.NO:40 , AP fee structure for M.E./M.Tech. courses in Private Un-Aided Colleges for Academic Year 2016-17 to 2018-19 Fixation of fee as per G.O.NO:40 , AP G.O.NO:40 fee structure for M.E./M.Tech. 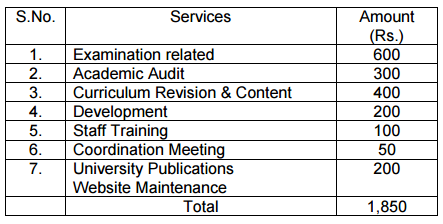 courses as per G.O.NO:40 , AP Private Un-Aided Professional Institutions fee structure for M.E./M.Tech. courses Fixation of fee as per G.O.NO:40. AP HIGHER EDUCATION – AFRC – Fixation of fee structure for M.E./M.Tech. courses in Private Un-Aided Professional Institutions in the State of Andhra Pradesh, for the block period 2016-17 to 2018-19 – Notification – Issued. From the Administrative Officer, O/o A.P.Admission and Fee Regulatory Committee, Hyderabad Letter No.1/AFRC/FFC/ 2016-17/47-48, dt.27-05-2016. 1.The A.P.Admission and Fee Regulatory Committee, in its meeting held on 27-05-2016, has resolved to fix the fee structure for M.E. / M.Tech courses for the block period 2016-17 to 2018-19 in respect of Private Un-Aided Professional Institutions in the State of Andhra Pradesh, as contemplated in Rule 4(v) of the A.F.R.C. Rules issued in G.O.Ms.No.6, Higher Education(EC.A2)Department, dt.08-01-2007. 2. The Administrative Officer, O/o A.P.Admission and Fee Regulatory Committee, Hyderabad, in his letter 2nd read above, has furnished the Minutes of the Meeting of A.P.Admission and Fee Regulatory Committee held on 27-05-2016 along with the recommendations of the AFRC regarding the fee structure for M.E. / M.Tech for the block period 2016-17 to 2018-19 in respect of Private Un-Aided Professional Institutions in the State of Andhra Pradesh and requested to issue necessary notification in the matter. 1) The fee structure to (229) Private Un-Aided Professional Institutions offering M.E. / M.Tech courses in the State of Andhra Pradesh is appended as Annexure to this order. a) An amount of Rs. 2,000/- as onetime payment per student at the time of admission towards Admission/Registration/Recognition fees and out of the said amount of Rs. 2,000/-, Rs. 500/- shall be remitted by the institution to the concerned University and the remaining amount of Rs. 1,500/- shall be retained by the institution. b) An amount of Rs. 1,850/- per annum per student during the course towards common services rendered by the University to the college as mentioned below and such amount collected by the College shall be remitted to the concerned University. a) An amount of Rs. 500/- towards library deposit and an amount of Rs. 500/- towards laboratory deposit (totaling into Rs. 1000/-) by way of refundable caution deposits at the time of admission only as onetime payment. a) The institutions/colleges shall collect the Annual Tuition Fee every year in advance only for that particular year either in a lump sum or in installments, if it so opts. b) The institutions shall not charge any capitation fee or any amount unauthorisedly or illegally under any other head or guise (e.g., donation etc. ), either directly or indirectly, other than the fee fixed by the Committee, as collection of any such unauthorized amounts would amount to charging of Capitation Fee, and that the surplus (profit) that is generated from the collection of the Fee must be for the benefit of the institutions, and cannot be diverted for other purposes or for personal gain. c) The institutions are informed that the fixation of Fee Structure by the Committee will not by itself enable or permit the managements to run the relevant courses in their institutions because, if the courses are otherwise not recognized and not permitted by the Government or All India Council for Technical Education/Concerned University at any relevant time, the same cannot be done. d) The fee, now recommended by the AFRC for the block period 2016-17 to 2018-19, is based on the details/figures uploaded by the institutions on line and is subject to further physical verification. If it is found that any of the data given by the institutions is not correct, the fee shall be revised at a later date and these facts shall be informed to the University concerned and All India Council for Technical Education for taking necessary action in accordance with law. Besides, such institutions/ colleges including the persons responsible are also liable for penal consequences.